Dr. (Med) Nikolaos Pistamaltzian graduated from the Medical School of the University of Crete in 1999. He received his training in Medical Oncology at the “Saint Savvas” Cancer Hospital of Athens, where he served in the 2nd Medical Oncology Department and the Bone Marrow Transplantation Unit. After completion of his residency he served as a Junior Consultant until 2012, to both positions. Since 2012 he is working as Consultant, at the Medical Oncology department of MITERA Hopital, a member of HYGEIA group. He is member of the Cancer Immunology and Immunotherapy Center since 2010. 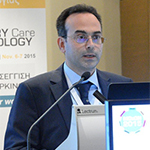 He is a Hellenic Boards of Oncology and an ESMO accredited member since 2010. AE37 is the Ii-Key hybrid of the HER2 derived peptide AE36 (776-790). Phase I trials administering AE37 with the immunoadjuvant GMCSF in prostate and breast cancer patients demonstrated the vaccine to be safe and capable of stimulating CD4 and CD8 T cells with HER2 specific anti-tumor activity. Here we present an efficacy analysis of our prospective, randomized, single-blinded, phase II trial of the AE37+GMCSF vs. GMCSF alone for the prevention of breast cancer recurrence (NCT00524277). After completion of indicated standard therapy, disease-free, node positive or high risk node negative breast cancer patients were randomized to receive either AE37+GMCSF (VG) or GMCSF (CG) in 6 monthly intradermal inoculations (primary vaccine series, PVS), followed by 4 booster inoculations every 6 months in the majority of patients. The trial enrolled 298 patients with any level of HER2 expression (IHC 1+ 2+ or 3+ or FISH>1.2); 153 received AE37+GM-CSF and 145 received GM-CSF alone. For 287 of the patients with follow up data, stratification analyses for clinical efficacy (disease free survival, DFS) are presented at a median follow up time period from the first vaccine of 53 months (range 1-97 months). Our data clearly demonstrate that patients with more advanced disease, not over-expressing HER2/neu and triple negative patients have a clear, statistically significant, benefit from the vaccine.